Build Time: 3 Hours approx. 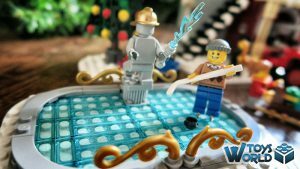 Welcome to the snowy LEGO® Creator Expert 10263 Winter Village Fire Station, where the firefighters are enjoying the calm of the holiday season. 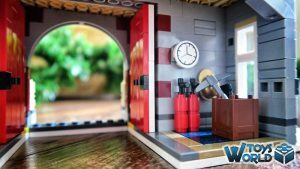 This delightful LEGO set features a 2-level, holly-adorned building with an upper-level kitchen, complete with a red telephone, table, fold-down bed and a LEGO light brick. Behind the large red fire station doors, you’ll discover firefighting equipment and a fire pole, while outside there’s an ice rink with a decorative firefighter statue, a decorated Christmas tree with transparent star and gifts, plus a bench and lamppost. 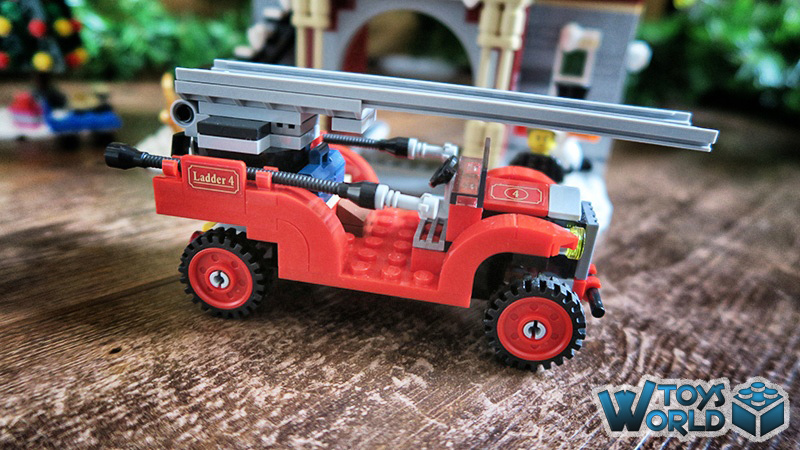 This set also features a classic red fire truck with a turntable ladder, hoses, toolbox and deep-tread tires. Gather the family and bring the magic of the holiday season to your home with this festive LEGO Creator Expert set. 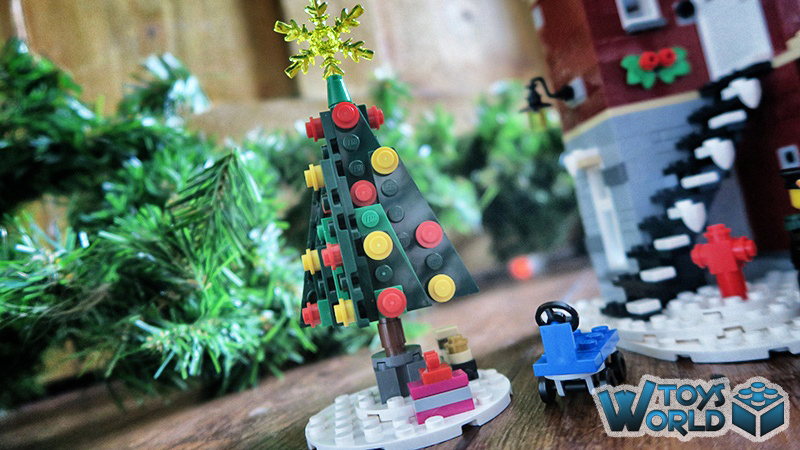 Christmas comes but once a year, and it has become somewhat of a tradition that LEGO release a Christmas-themed set each year, as part of their ‘Winter Village‘ theme. 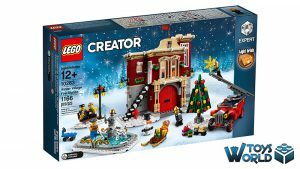 This year will particularly please fans of the LEGO Creator Expert ‘modular’ builds, with the release of the ‘Winter Village Fire Station ‘ set. Whilst it may be much smaller than the other modulars we’ve come to love, we get a pared down version here – but one that still packs a punch with some awesome features, whilst still feeling decent in the overall size. 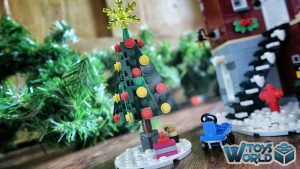 There’s also the added bonus of some external builds in the form of a fire engine, a Christmas tree (complete with presents), an ice rink and a park bench. The exterior of the main fire station is adorned with icy motifs, along with holly sprigs, and there’s a great use to the right of the build with the fence panels turned on their sides to give a wrought-iron panel effect to the fire tower. There’s a large double-door entrance for the fire truck to fit through – some online sources suggested it doesn’t fit through, but we can confirm it definitely does! There’s a stairway up to the second floor, which is located to the left of the station, and the very top floor features a roof area and a light brick – which is utterly, magically festive, once lit up! It REALLY helps to bring in the warmth, and as you peer through the windows, you’ll wish you could shrink right down and join the firefighters for a hot dog and a cuppa! As for the interior; on the lower level we have the tool room to the right and the bottom of the fire tower (complete with fireman’s pole), to the left. 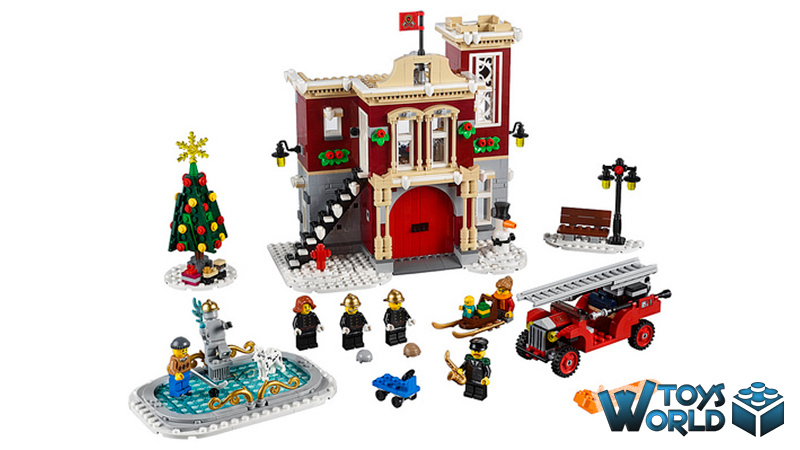 It would have been nice to include the pole from the ‘Fire Station ‘ set, which has a twisted pole that spins the staff as they drop from the top to the bottom. As this is a much smaller set, it would have given a little more air time when minifigures slide down the pole, but this is a minor niggle. 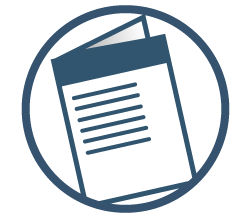 On the first floor, we have an incredibly inviting staff room, complete with kitchen, seating area, telephone, sleeping area, and even a dog bed! There’s also direct access to the fireman’s pole, for when the call comes in. Looking at the smaller, external builds, the fire truck is of the classic style, complete with ladder, which raises and rotates. The ice rink features a grey fireman statue (technically a 7th minifigure), as well as some lovely gold detailed on the front and back of the rink. 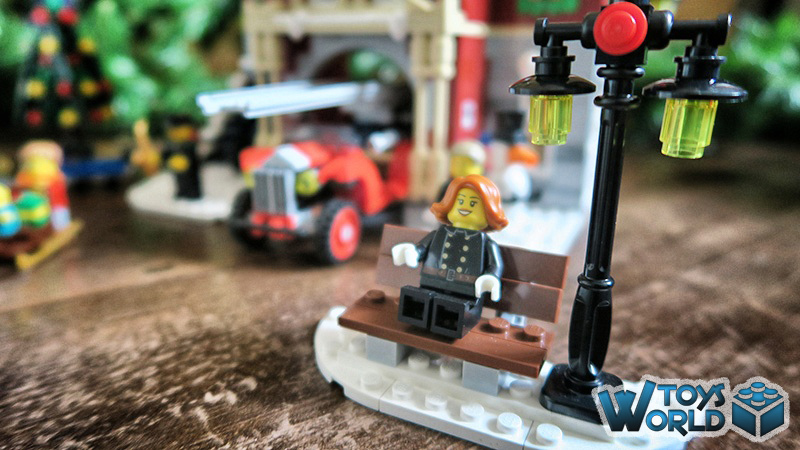 The park bench includes a streetlamp, and can be situated anywhere you like around the exterior of the fire station. Finally, there’s the Christmas tree, which was one of the most enjoyable elements of the set to build. It doesn’t feel like much when you’re building the green slats, but when they’re all finished and you connect them to the trunk, the whole thing (complete with a star and red and yellow baubles) really comes alive! There’s even a simple present and train that sits under the tree. You also get a sleigh and a blue trolley. 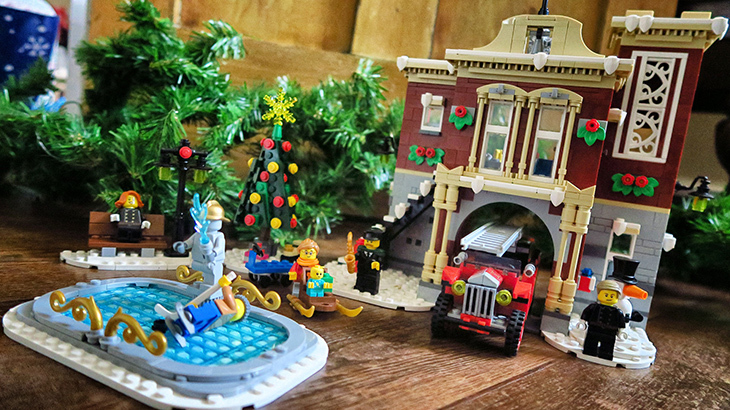 There’s a total of 6 minifigures in the set, as well as a baby and a snowman (complete with top hat); 3 x firefighters (2 x male and 1 x female), a musician, a hockey player and a girl. 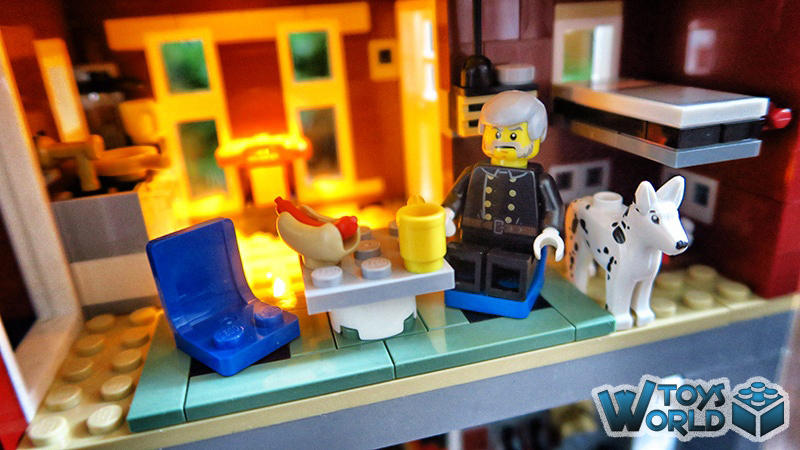 You also get a Dalmatian who can feel right at home on his bed in the fire station. This is a wonderfully festive set that really harks back to a bygone era, loyally recreating some of the styles of the time. Definitely one to add to your Christmas list! + Click Here to buy the ‘Winter Village Fire Station‘ set from LEGO for £84.99! + Follow ToysWorld on Instagram! LEGO 10263, 61110, Christmas, Fire Station, LEGO, LEGO Creator, LEGO Creator Expert, LEGO Fire Station, Winter Village, Winter Village Fire Station. permalink.